When you first walk through our doors, you will feel as if you are at home. This is not your average rental property. Our Kiawah Island, SC vacation rental home is located at 700 Glossy Ibis Lane beyond the second gate in Vanderhorst Plantation. The large deck across the back of the house overlooks Cinder Creek. This marsh view is incredible and a haven for white snowy egrets. You will enjoy the changes in the marsh with the high and low tides. Across the street is a fishing and crabbing dock. You can catch flounder and redfish here! Our luxury 3600 square foot home features two master bedrooms with king-size bedding and televisions. The third spacious bedroom has two queen beds with TV. All bedrooms have their own bathrooms. There is an upstairs loft with a queen sleeper sofa. We provide fast access DSL and wireless. The formal living and dining room has 18 foot vaulted ceilings with an awesome view of the marsh. There is an expansive kitchen with breakfast area that opens into the great room with TV.. There are rear French doors to the deck that lead to the swimming pool. The salt water pool has a heat pump for year round enjoyment. Salt water pools require fewer chemicals and less chlorine. The pool is cleaned twice a week and is completely fenced in with two gates. It is very private. A charge for pool heat may apply in spring and fall. The kitchen is well-equipped for the gourmet. Our appliances are all new. We have provided an abundance of utensils including a coffee grinder, a blender, a food processor, a mixer, etc., and all that is necessary for the preparation of almost any meal. There is a vast array of quality pots and pans as well as cooking and serving dishes. This property has a Superior FIVE-STAR rating by the resort. 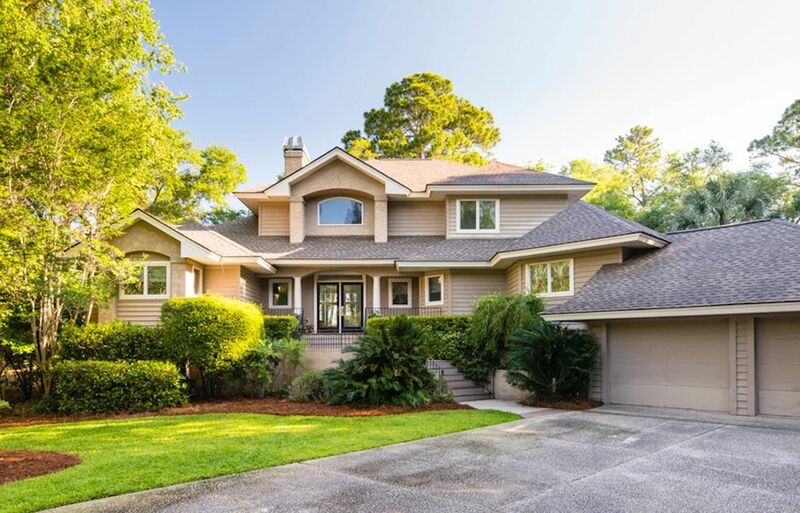 Our wonderful home is situated on almost a full acre lot with beautiful marsh views. We provide you with a comprehensive Information Booklet prior to your arrival that includes names, telephone numbers and websites of restaurants and services in order that you might arrange for bicycle delivery prior to your arrival, tee times, fishing trips, kayaking tours, spa visits, restaurant reservations and more before your arrival at Kiawah. The private beach of Kiawah is approximately 700 yards away. If you choose not to walk or bike to the beach, there are two beach parking lots nearby. From September through May, we accept short-term rentals with a 4 night minimum. PLEASE SEE CALENDAR FOR AVAILABLE DATES. CONTACT US FOR WINTER MONTHLY RATES. 4 TVs, Stereo Surround System (speakers throughout downstairs), Hair Dryers in each bath, Electric Oven, Gas Stove, Private Pool (cleaned twice a week from Memorial Day to Labor Day, then weekly), Beach Chairs & Umbrellas, Cooler, High Chair, Baby Monitor & Pack'n'Play, Portable Crib with mattress, High speed DSL internet connection and wireless. Free long distance in US. Crabbing, Kiawah Kids Camp, Kiawah Nature Programs, Fabulous Art Galleries & Antique Shopping, Charleston Aquarium. There are 10 miles of wide perfect beaches, 30+ miles of bicycle paths and 5 top golf courses. If that is not enough, Charleston is only a 40 minute drive, and there you will find wonderful walking/sightseeing, shopping and dining!